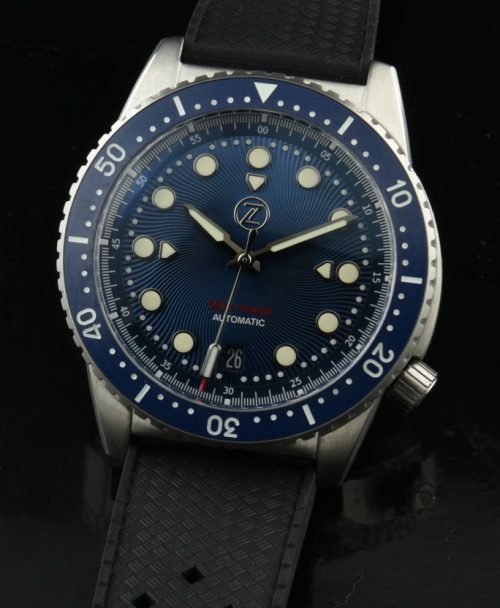 This is a 2017 new dive watch made by ZELOS and this is the “Mako”. This micro brand has a fine SWISS made automatic Selita SW 200 movement and is water resistant to 500m. The sapphire crystal is domed. The dial design is easy to read. The turning uni-directional bezel has a vintage look. The hefty case measures 41mm. and and 15mm. thick. This watch comes with a rubber dive band and extra fine tan leather spare. There is a very supple leather watch holder (holds 4 watches) and a great looking wooden box, further adding its value. This is your IDEAL TRAVEL WATCH! The entire watch is pristine.